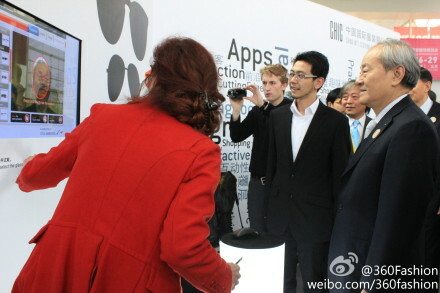 Anina with Chinese Government Chairman, Mr Du, trying on Augmented Reality Glasses at the CHIC 360FASHION TECH ZONE. Lately it seems that everyone is getting a 3D printer, which the higher end models range in price from 3500 Euro and up is not a light investment, but it seems the perspective (so to say) is that it is a good investment for fashion designers. Also a new evolution in eyewear is using Augmented Reality such as Trylive solutions from the web for customers to try on the frames using any webcam. Limitations apply if the customers is already wearing funky glasses and by removing them, cannot see the Augmented Reality version on their eyes–it’s a funny effect for sure. 3D printing differs from using the Augmented Reality 3D methods in that they can create physical objects, and combined with home 3D scanners, the idea to scan your favorite pair of glasses and re-print them should you bend or smash them, is highly attractive. 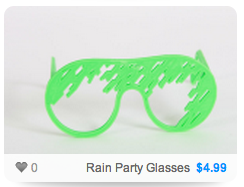 How then, to protect against counterfeiting? Will the eyewear industry go down the same rabbit hole as the music industry, meaning that if you have bought the object it is your right to print the object? On purchase = many devices so to speak? How will China embrace this concept considering the Chinese government is cutting down on the fake products market starting in June 2013. “Using unique multi-material technology, customers can now even print the rigid plastic frame along with the clear transparent lens all in a single build — requiring no assembly — in just a matter of hours,” added [Andy] Middleton [Refernce BOF]. Middleton’s point of view is unique and points the way to one of the directions that the eyewear market could quickly evolve to in that the designs are sold as a download to 3D print strategy, selling their glasses design for multiple paid downloads. Will this lead to a new iWear App store for 3D objects which is one of the fast growing trends for 3D printing object shops popping up across the web such as Brooklyn-based Matkerbot Thingiverse and South Carolyna-based Cubify. “A team at Virginia Tech University is experimenting with embedding quantum dots into 3D printed materials to help companies tag products with identifying markers in order to help prevent counterfeiting, but it may be years before the technology is widespread.” concludes the BOF article. 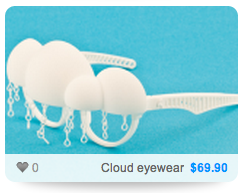 However items including tags such as Thinglink may become a hobbyists way of protecting their designs. Combining the 3D printing together with a DYI mobile app, allowing users to create their own glasses, try them on with Augmented Reality, and the pay for the 3D printout according to the designs parts seems like a natural evolution from our point of view. And yes, we are wearing glasses.